We had discovered an accursed country. We had found the Home of the Blizzard. 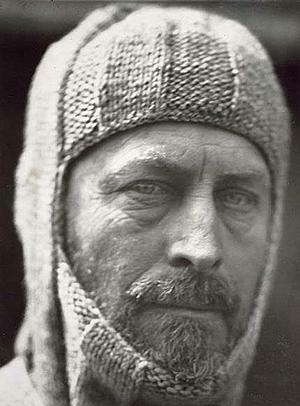 Sir Douglas Mawson 1882-1958 was born in Yorkshire in England and moved to Australia as a young boy. He began studying geology at a Sydney university and in 1905 became a lecturer in the Adelaide University. His first expedition was in Shackleton's 1907-1909 Nimrod Expedition, which he successfully completed following a treacherous route to the magnetic South Pole. Mawson was later on invited on Robert Scott's terra nova expedition. He turned down the offer, instead he was planning his own expedition. An expedition which would chart a 2000 mile coast of a yet unexplored part of Antarctica directly south of Australia. Mawson's crew consisted mainly of Australian and New Zealand universities members all of which boarded the Aurora, the ship which would take them to there desired location. An oceanic survey was planned and in particular a survey of Macquarie Island some 850 miles south east of Hobart. He also made plans to set up a hut in the mainland of Antarctica where half his team was to live in for a year whilst the other half was dropped of down the coast to be picked up in the following year. Mawson's team set off on December 2nd 1911, with their hearts full of hope and minds full of excitement, they felt like they were ready for anything, but they weren't. In the first night of sailing the winds went to full gale making waves smash against the wooden sailing boat and sending some cargo flying across the deck. The crew had their work cut out for them they had to tie down all the cargo and pull in the sails in harsh winds. Unfortunately some of the fresh water supplies went overboard and from that night on water had to be rationed. This rough weather continued on for days until, on December 11th, they spotted Macquarie Island. Their first objective was to set up a base, consisting of a hut and a wireless. They soon set off again and in a few more days arrived in Antarctica. They called their landing Point Cape Denison. Their base was set up here as well. Turns out that they had landed in one of the windiest locations on earth; anything not tied down was blown away. Mawson stayed in Antarctica for all the months to come, going on many adventures into the blinding white ice and snow. One of his adventure almost got him killed. He had set off with two other companions for a journey up the coast. They had to get back to camp but were 315 miles up the coast with only 10 days of rations left, so they ate the dogs. He and his companions made it back to the camp to see a speck on the horizon which was the Aurora, leaving. But six men had been left behind in case Mawson and his companions came back. The Aurora did come back and picked up Mawson and the rest of the crew on December 12th and on December 24th the expedition was ended and counted as one of the greatest Australian expeditions in history. Mawson showed all the characteristics of a hero in what he did. Staring into the face of the unknown is a difficult thing to do for any human but under every test that nature through at him, Mawson remained calm and courageous, which inevitably led to the success of the expedition.